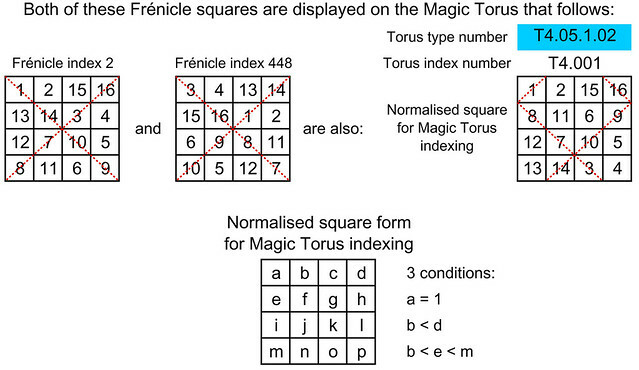 In a previous article "255 Fourth-Order Magic Tori, and 1 Third-Order Magic Torus," the 255 fourth-order magic tori have been identified and listed by type, following the numerical order of the Frénicle index numbers of the squares displayed on each torus. Although it was useful to begin this way, the classification by type is not practical when searching for a specific torus starting with any square. The normalised squares are not necessarily traditional magic squares. Whether magic or semi-magic, they are just standard viewpoints of each magic torus. To see the other squares that are displayed by the torus, you need to displace the viewpoint, as explained in a previous article "From the Magic Square to the Magic Torus." Though the representation by normalised squares may not be ideal, it does give us a good insight of the subtle permutations that engender essentially different tori. The interrelationships of these tori are explored further and illustrated in a more recent article "Multiplicative Magic Tori." This post shows that the 255 magic tori of order-4 are different multiplied states of 82 Multiplicative Magic Tori (MMT) of order-4! To view the complete Table of Fourth-Order Magic Tori, please note that if you click on the button that appears at the top right hand side of the pdf viewer below, a new window will open and full size pages will then be displayed, with options for zooming. Further to subsequent studies published on the 28th March 2013, this table was revised on the 14th April 2013, to take into account the sub-magic 2x2 squares that are displayed on each torus, and then again on the 28th April 2013, to integrate new subdivisions that take into account different Dudeney types. I wish to express my thanks to Aale de Winkel who pointed out an initial inversion of T4.003 and T4.004, which have since been interchanged to respect numerical order. 255 (the number of fourth-order magic tori) is now the fourth number of the sequence A270876 "Number of magic tori of order n composed of the numbers from 1 to n^2," published by the On-Line Encyclopedia of Integer Sequences (OEIS). Since the 21st January 2018, the 255 magic tori of order-4 are shown to be different multiplied states of 82 Multiplicative Magic Tori (MMT) of order-4!